Hundreds of natural caves can be found throughout every part of Iceland. Some are created from the many volcano eruptions and others may disappear each year because they are made of ice. There are even a few that are man-made, but our Iceland Wedding Planner team only supports the ones nature makes. Hjörleifshöfði (Hjorleifshofdi) is a cave that sits within Southern Iceland. 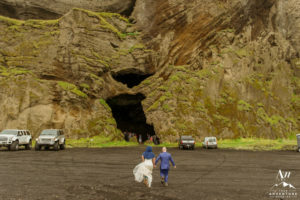 It is one of the largest natural caves in Iceland and an ideal location to hold your Iceland wedding (others that are bigger are under ground in lava tubes). We would like to educate you a little bit on this amazing spot in Iceland… The mountain / cave / surrounding area is all on private land so you must have permission / permit to hold any wedding related event or a wedding related photo session (proposal, engagement session, pre-wedding session, honeymoon session, anniversary session, styled sessions, portfolio work, and wedding models, etc). Our team, Iceland Wedding Planner is the only wedding planning and photography team in Iceland allowed to hold weddings in this cave in Iceland. We have a contractual agreement with the landowner to exclusively handle any and all interest and bookings in regards to anything wedding related at Hjörleifshöfði Cave. If you wish to plan a Iceland wedding ceremony in this cave… You must contact us for more details to see if your date is available and what costs may apply. If you are a photographer photographing a couple on their wedding day or pre/post wedding photos in Iceland, you also must contact us in advance for availability, permission, and what costs may apply. In order to keep the cave exclusive, pure, clean, and in perfect condition, this is required. Furthermore, bookings are also required to stop groups from colliding (other weddings, events, groups, professional photo shoots, commercial projects, film crew etc). People are free to visit the cave on their own personal accord (still open to the public) but professional wedding photography is not allowed without our permission in advance. These methods are put into place to ensure privacy and exclusivity for your wedding ceremony / group. It is also to protect the land itself from being destroyed (IE, illegal off roading, rock formations, greenery, etc.). Overnight Stays (camping) or usage of the Cave without permission is NOT allowed. Do NOT leave any trash (leave the cave and surrounding area better than you arrived). There are no bathroom facilities in or around this area. Please do not use the inside of the cave as your personal bathroom. This cave sits on a black sand desert. Although the area around is sandy, there is vegetation that is trying to grow… Please stay on the marked track. It is illegal to off-road in Iceland (fines will apply). Commercial / Professional Photography of any type is NOT allowed without advance permission. Thank you for your time, attention, and respect of this!